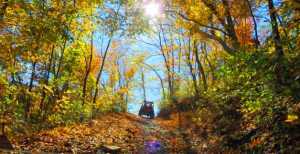 In a world full of overrated pleasures and manufactured entertainment, what could be a better antidote than the authentic thrills of The Hatfield & McCoy Trail System? The wilderness is our landscaper, with flora and fauna competing for attention. Nature is our architect, as mountains create vistas more amazing than anything one could see from any skyscraper. The moon and stars stand in for neon lights. Let amusement parks keep their roller coasters. We offer a riding trail for every day of the week, with an eighth one soon to be opened. No two rides are ever the same, as rugged terrain winds its way to panoramic views that deserve to be seen only by those with wings or a brave spirit. Concrete jungles may need makeshift fountains to decorate their world, but ours comes adorned with the natural beauty of the aptly named Twin Falls State Park. Streams and rivers, so beautiful from the shore, can be further enjoyed on a kayak or canoe expedition, or even on an airboat ride. Feuding families are just the beginning of our illustrious past. The homes of coal barons and battlefields of labor have been turned into exciting museums and attractions. Entire towns like Bramwell and Matewan have been restored to tell about a unique part of our great nation’s history. Off the beaten path—in this case literally—is a region replete with celebrated amenities. Our restaurant scene dots the map with places offering Appalachian cuisine famous for its use of homegrown produce fresh from the earth. Chefs offer classics like Brunswick stew or specially prepared venison, as well as new twists on old favorites like pizza, burgers, and milkshakes. Bakeries and coffee houses offer great meeting places to catch up with the crowd, or just to enjoy a fresh brew and dessert. Meanwhile, a local moonshine distillery is the perfect place to get acquainted with mountain spirits of a different kind. Where to lay your head after a full day of trailblazing and sightseeing? Our lodging selection is eclectic and unique. Of course, we offer an array of hotel brands known to all selective travelers, offering all the comforts one requires. But if you’re longing for a more mountain-type experience, logs cabins nestled in the cool shade of forests offer rustic charm from the outside, but modern and up-to-date luxuries on the inside. Meanwhile, graceful bed & breakfasts created from historic homesteads provide wonderful lodging with a story to tell. For those who enjoy being close to nature, multiple campgrounds provide the services and conveniences every camper needs. Visit Hatfield & McCoy country, where everything is the real deal!